Don’t worry! We’re here to help. Our experienced residential and commercial movers can make the transition easy for you. Brown Box Movers offers excellent moving service at affordable prices. We take pride in each move our team completes. If you are looking for quality movers that are fast and efficient look no further. We provide quality, speed, and efficiency for affordable rates. Pick Up & Delivery of Purchased Goods – Furniture Etc. We are competitive with our pricing. We will absolutely give you the best price we can offer. 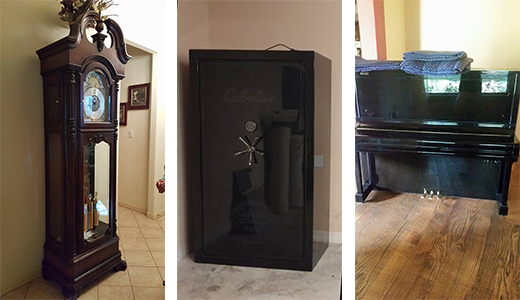 Pianos, Gun Safes, Game Machines/Tables, Grandfather Clocks, Statues, Workout Equipment, Playgrounds and any other heavy items must be discussed at time of booking service. We provide extra padding and protection for any fragile pieces. Our movers are licensed & insured to make transportation a breeze. We provide FREE furniture unpacking and setup upon delivery.